Breville juicers seem to have become more and more popular not only due to the fact that using one you can create a wide range of drinks that are both healthy and delicious, but also due to the fact that they’re very easy to use. Yet while some juicers can get you the enzymes and nutrients you need in a single cup, others don’t do it that well and that’s why you need to know more about some of the factors you should consider prior to getting your first juicer. The BJB840XL is a very simple to use juicer that not only has a small footprint, but it also features a die-cast metal construction which makes it look amazing in your kitchen. With it, you can create delicious blended drinks, nutritious smoothies with one hundred percent fresh juice. 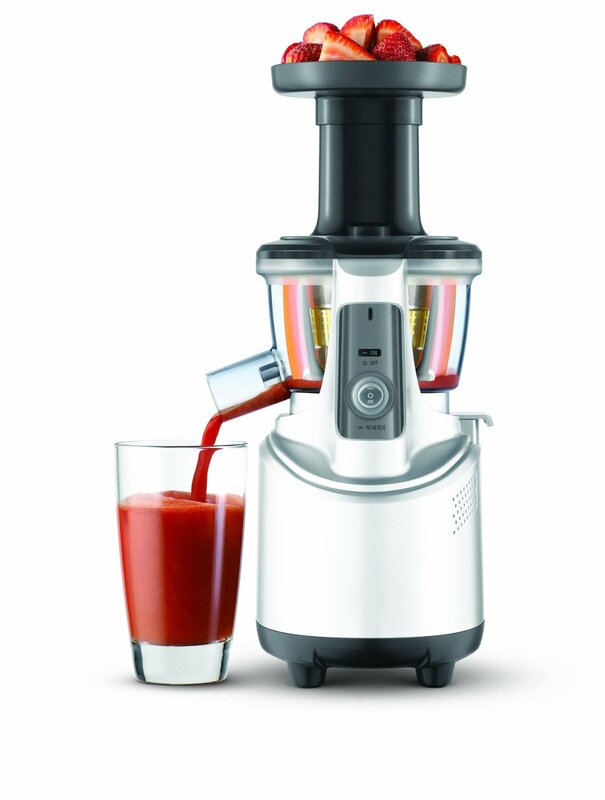 Better yet, the interchangeable blender and juicer attachments combine 2 kitchen essentials in a single powerful unit. When it comes to the blender, it features 5 variable speeds with pulse, smoothie and ice crush settings, a chipping and scratching resistant fifty one ounce glass pitcher, but also Bowl and Hemisphere Blade technology which helps eliminate food traps. The extra wide feed chute of the 5 speed juicer makes it easy to juice larger fruits, while the forty ounce jug with froth separator can hold enough juice for a few people. The BJE820XL allows you to not only juice, but also puree in a single machine, making it easy to enjoy natural, nutritious and delicious juices, but also prepare purees for your baby or even for making different kinds of pies, tarts and other delicious treats. Unlike other juicers on the market today, the BJE820XL features dual discs, with one of them being specifically designed to juice soft fruits and the other being specifically used for juicing hard produce. The juicer features titanium reinforced cutting blades and comes with a filter basket made of stainless steel which is excellent for effectively shredding fruit and spinning out the pulp. Because of that, no matter if you’d like to juice melons or apples for instance, the results are always going to be excellent. The commercial quality BJE820XL is fitted with a powerful 1200W motor with five electronic variable speeds that range from 6500 and all the way to 13000 rotations per minute.The chute is also quite large (3 inches) meaning that it’s easy to juice whole fruits without having to worry about wasting time preparing them. There are many other great features you’ll love about the BJE820XL, including the 34 Oz juice jug, 101 oz pulp container, heavy grade die cast metal body and patented direct central feed system that ensures maximum juice extraction. 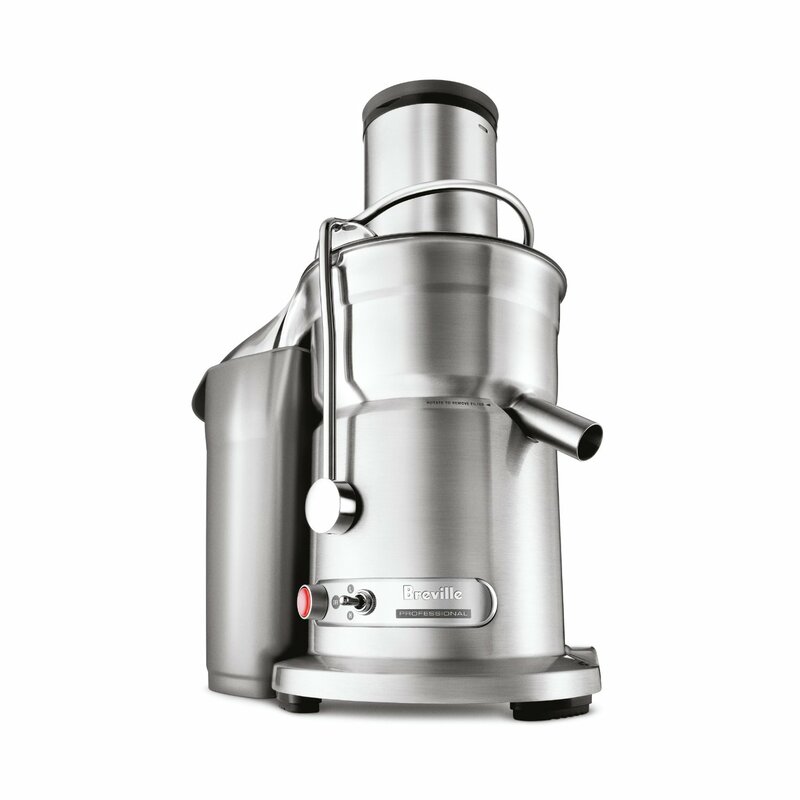 The variable speed Breville BJE510XL is an excellent juicer that features adjustable variable speed which means that it can easily extract the maximum amount of juice from any fruits with little waste. Under heavy loads, the BJE510XL’s built-in smart chip increases power to the cutting disc in order to ensure that juicing is done as efficiently as possible. One thing that sets Breville juicers apart is the fact that they integrate the company’s patented juicing system which helps extract a lot more nutrients than any other juicers out there, but they also transfers less than one point eight degrees F of heat. Because of that enzymes are properly protected and the absorption of select nutrients is maximized. The Breville BJE510XL features a 900W motor and has speeds that range from 6500 RPMs (ideal for leafy greens and softer fruits) to 12500 RPMs which is ideal for extracting the maximum amount of juice from dense foods, such as beets and apples. You’ll also going to love the large three inch chute which means that no longer will you need to worry about chopping fruits prior to juicing them. There are also 5 juicing speeds you can choose from, including one for hard vegetables, one for apples, one for pineapples and one for soft food. Cleaning the Breville BJE510XL is very simple and that’s because most parts are dishwasher safe. Featuring home kitchen convenience, but offering commercial performance, the 1000W Breville 800JEXL runs on 2 speeds, including 6500 RPMs for softer fruits and 13000 RPMs for harder fruits. Design wise, the 800JEXL features a gorgeous die-cast metal design, which seems to always get mentioned by all Breville Juicer Reviews you can find online about it. If you owned a Breville juicer before, you probably are aware of the fact that the company usually fits their units with a 3” chute, so that you don’t have to worry about wasting time and cutting the fruits before juicing them. The 800JEXL also comes with a safety locking arm, overload protection, cord storage, a large capacity pulp container with handle and a 34 oz juice jug with froth separator. On the inside, the cutting disc is titanium plated, meaning that it’s going to last you for a very long time, even if you are the type who likes to juice on a daily basis or follow a certain diet that requires you to use the juicer very often. Speaking of which, the juicer also comes with a recipe book which is going to teach you how to make a wide range of delicious, nutritious and healthy natural drinks. Better yet, the Breville 800JEXL features locking arm bolts that move up to a quarter of an inch in all directions in order to ensure a great fit in the locking arm. As for cleaning the juicer, it’s all very simple and that’s because its parts are dishwasher safe. We all know that most people who buy centrifugal juicers are quite happy with their purchase, but what if you’re the type who likes his juice to be smooth, yet also contain a bit of pulp? Well, if that’s the case, then you may want to consider getting a masticating juicer. Also known as single auger or slow juicers, they effectively crush and then squeeze the produce instead of shredding it in order to get every last drop of juice out of it. As a result, this process boosts the amount of nutrients extracted from the produce and given the fact that more fiber stays in, you get a nutritious and tasty glass of smooth and thick juice. Since this is a slow juicer, you can easily juice not only soft fruits, but also harder fruits such as apples, pears, carrots and so on. This is all made possible thanks to the Ultra quiet 240W motor which is not only very powerful, but also transfers no heat to the juice, helping you get the most nutritious and delicious glass of juice you’ve ever had. 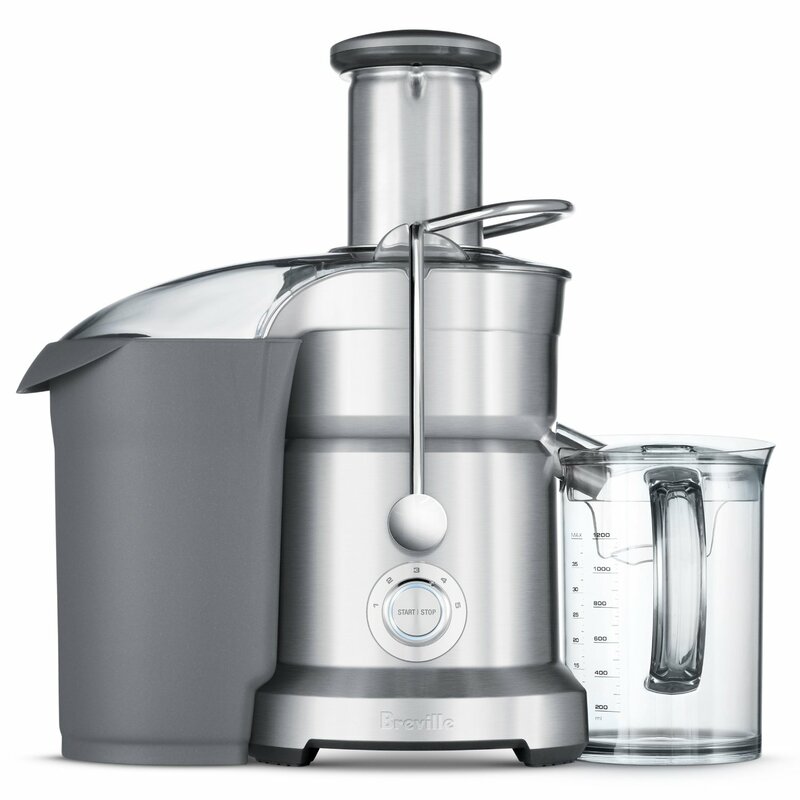 Some other features you’ll love about the Breville 800JEXL include the 2 step safety start system, meaning that you can use it only after all parts have been assembled and the lid locked, an auto purifying filter basket and direction control which means that if needed, vegetables or fruits can be dislodged from the juicing screw. 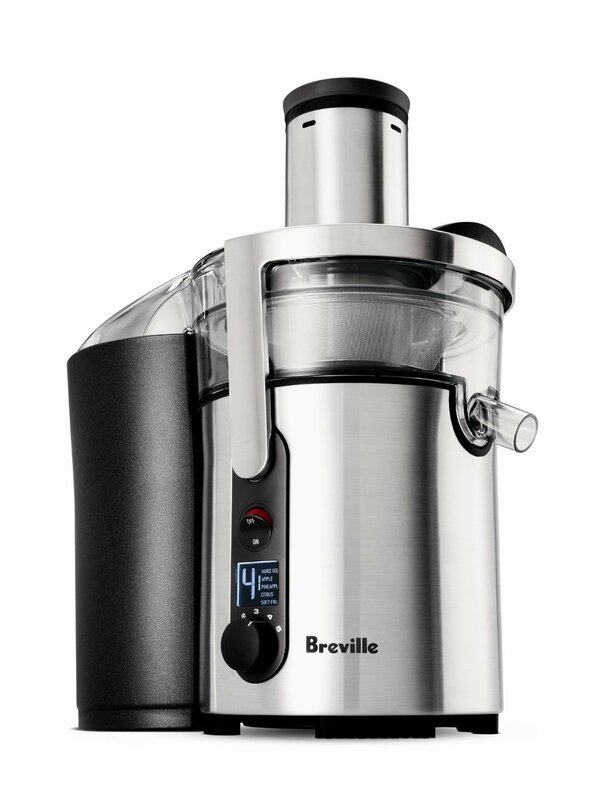 The Breville BJB840XL features a high powered 1500W motor for efficient blending and juicing, noise and vibration control, but also a durable and interchangeable metal base. When it comes to cleaning the juicer, you’ll love the fact that the parts are dishwasher safe, so you won’t need to worry about wasting them and washing them by hand. All in all, if you want a juicer that’s going to help you make some of the most delicious juices you’ve ever hand and one that also eliminates prep time, then the BJB840XL from Breville is certainly a great choice. The BJB840XL has been called the Top 1 Breville Juicer on the market by tens of thousands of people that have already bought and used it in order to create delicious and nutritious juices on a daily basis. This model is recommended not only to those who want to go on a diet and want to start living a healthier lifestyle, but also to those who simply enjoy juicing at home without having to worry about cutting fruits or vegetables, which we all know makes a lot of people quit juicing after a while. One thing you’ll love about the BJB840XL is the fact that it comes with a 1500W motor and not only will you be able to juice with it, but also blend. So basically, for the price of one machine, you get 2 different functions, making this a very versatile unit you can use for a wide range of purposes. However, everyone knows that no matter how great a juicer may be, you still have to clean it and that can generally take quite a while. Well, in this regard, the BJB840XL features dishwasher safe parts, which means that when it’s time to clean it, all you need to do is toss them into your dishwasher and that’s it. At the end of the day, if you want to get the best juicer on the market today and start living a healthier life then there’s no doubt you definitely need to take a look at the Breville BJB840XL. 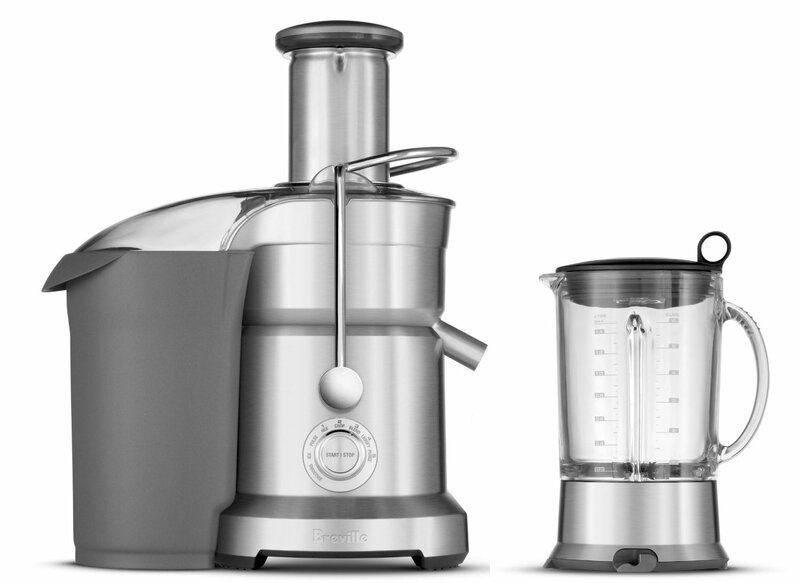 Previous Previous post: 5 Best Hurom Juicer Reviews To Get You Going!